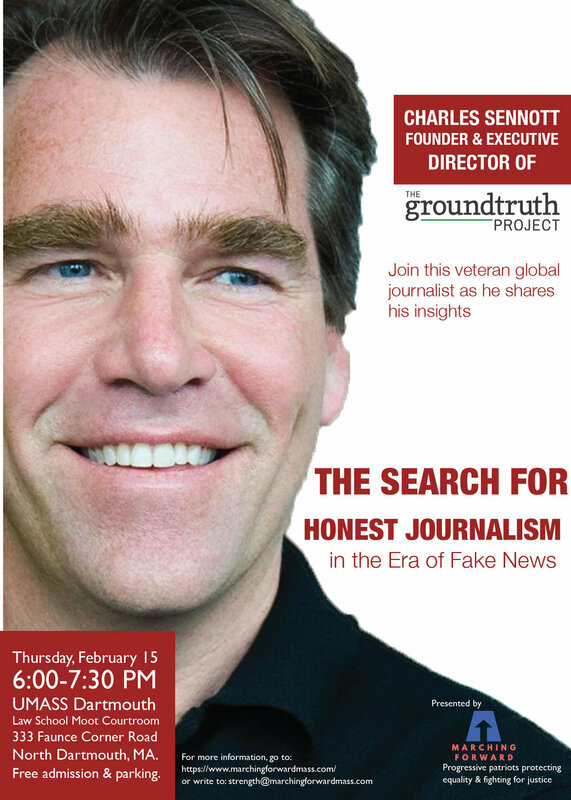 Please join us next Thursday, February 15th as our Journalism Huddle will host a talk by Charles Sennott, the founder and executive director of The GroundTruth Project, a nationally-recognized non-profit news organization championing the work of emerging journalists. The 6 PM event is free and open to the public. It will take place at the Francis J. Larkin Moot Courtroom at the UMass Dartmouth Law School, 333 Faunce Corner Road, North Dartmouth, MA. Ample free parking is available. Please join us for our first general meeting for 2018 as we plan to have information on several dozen candidates who are running for office this year, with the intention of soliciting feedback from all of you in choosing a smaller group of candidates which members of Marching Forward will actively support. We are compiling a good list of candidates to share with you and are doing the research on the candidates for you. Our national and international health depend on research and intervention funding for epidemics and potential pandemics. The CDC is the leader in confining very serious disease threats. We are looking at ways to respond to this attack on the CDC. "Donald Trump is publicly considering firing Special Counsel Robert Mueller, the person leading the Department of Justice investigation of possible criminal actions by Donald Trump and members of his presidential campaign, as well as the efforts to conceal those activities. It's also possible that, rather than firing Mueller, Trump will obstruct Mueller's investigation by issuing blanket pardons of key figures being investigated, firing Deputy Attorney General Rod Rosenstein (the person overseeing Mueller), or taking other actions to prevent the investigation from being conducted freely. Indivisible teamed up with MoveOn and dozens of other allies to plan rapid response actions in case Trump takes significant actions to undermine the Trump-Russia investigation. Will the Democrats Nuke the Party to Win the Democracy?